Not much going on at first. I take a bite and it's definitely maple, but in a more complex way. I take a few more bites and I'm having trouble deciding something. The base either tastes like it has a strong, brown sugar undercurrent to it or a very mild alcoholic complexity to it. Not a typical burn or bitterness mind you, but this certain small note that reminds me of the occasional alcohol inspired flavors we have had on the blog now and then. 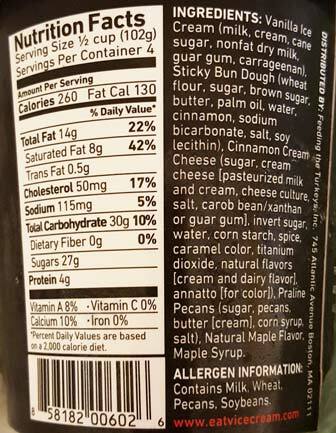 I don't see any "special" ingredients listed, so I think it's just the way everything has come together. Now it's not just the base we bought this for, it's the "promise" of mix-ins and a swirl (ripple) that we have to dig for. The problem is that I didn't hit the mix-ins until I was basically done with my first serving. 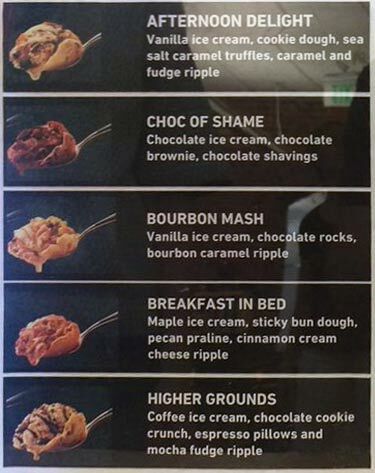 I did get one sticky bun dough bit which seemed nice, and I got one nice flavorful pecan bit, but that was it. The good news is that I've set myself up nicely for round two. On Second Scoop: See, I told you I set myself up nicely, except for the swirl maybe, so let's start digging. I liked this yesterday and I like it even more now that the mix-ins have kicked in. The sticky bun dough is pretty good (though it could use a little more sweetness in my opinion) and the pecans are nice if not particularly huge. 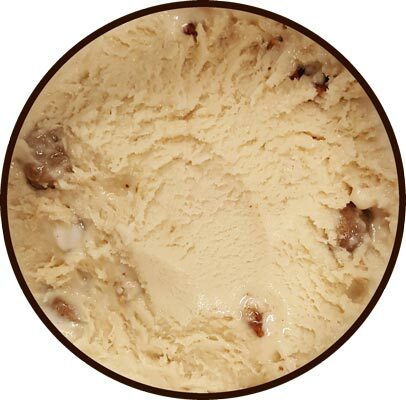 Yesterday I thought my pint might be a little freezer burned but I realize that it's actually tiny puddles of the ripple praline that have a little bit of texture to them, something akin to still being a little frozen. Anyway, I do like this, but I had a thought. I realized this is very similar to the new B&J's Pecan Sticky Buns flavor. 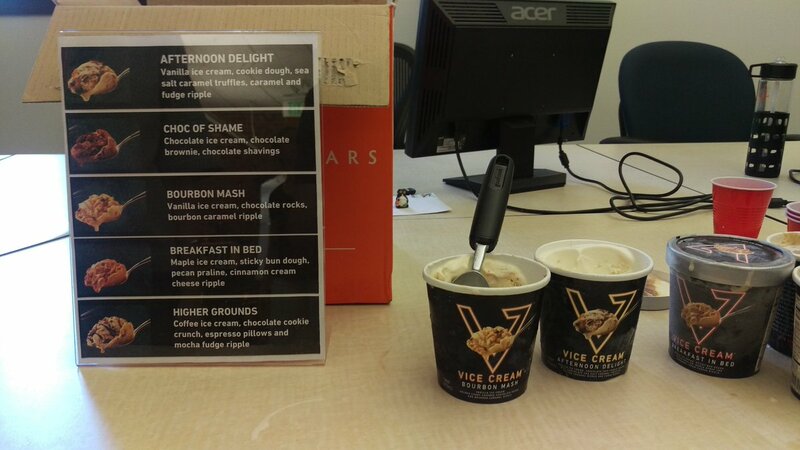 The technical difference is that vice cream has added maple in to the mix. 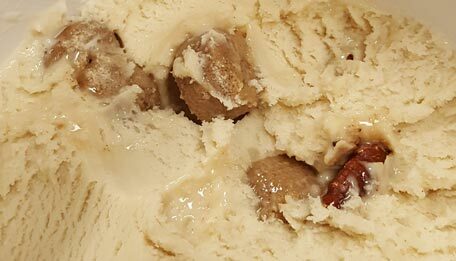 The real world difference is B&J's uses larger pecans and has a more noticeable cream cheese factor. This translates to the B&J's version having more of a butter pecan vibe while this has more of an air of a breakfast treat to it. 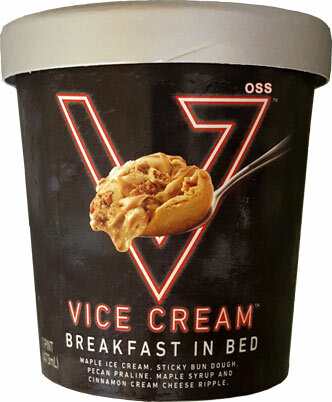 So is it really "Breakfast in Bed"? I say mission accomplished. Final Scooping: I found the swirl! I big ol' puddle of goo at the very bottom of the pint. I take a spoonful and it's got a bit of fireball kick to it. Eating it with a few dough chunks does help balance it out, but it's still fairly strong. I don't even know what to do with all of it, there's just not enough ice cream left to mellow it out (but I eat it anyway). It basically looks like a grayer version of cookie butter. Oh, for the record, it doesn't taste like cream cheese, at least not very much. If this was an established company, I would pick on them for the settling of the swirls and mix-ins, but I get that they just started production and they need time to work out the kinks. We can't expect perfection on day one. It's not like that have the budget to throw out an entire run of ice cream. That said, I don't know how to feel about this flavor anymore. The existence of the potent swirl changes things. I don't think I would have enjoyed this flavor as much if the cinnamon had been constantly messing with the other components. Sept 2016 Update: Dan from Vice Cream left a nice long update over on my Choc of Shame review. They are very much aware of the sinking mix-ins and are addressing the issue! It took me like 5 minutes while Googling them to get the "joke". My first thought was "80s" and (v)ice cream. If they added bacon it would be a game changer. 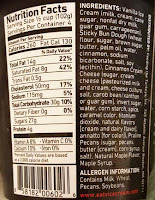 I want to add or remove something from each flavor before actually thinking one is above the others to try. I added a link at the beginning and near the end of the review as requested a few days ok... maybe I'll just embed the list to make it easier. Made it halfway thru my pint..no fillings yet! Thought I got a bad pint until I read your review and realized it's prob all at bottom. 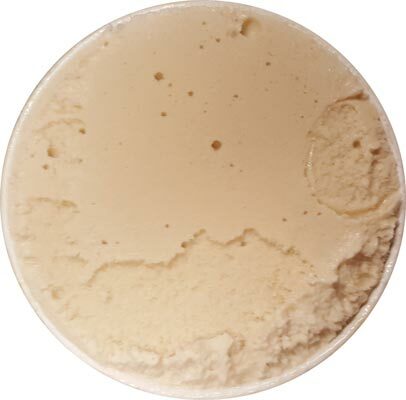 Maple ice cream has decent flavour but def a little icy,grainy and leaves residue on spoon. Similar to some home ice cream batches I have had. 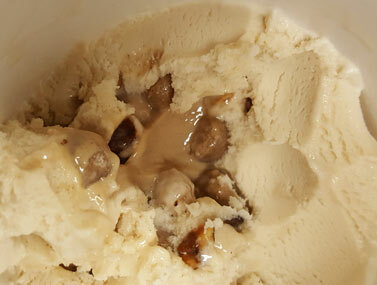 PEOPLE: STIR YOUR ICE CREAM -- MIX IT UP. This is a rule of true ice cream worshippers. Helllllooooo !!!! thank you. Says you. Rule #1 of On Second Scoop: Don't tell other people how to eat their ice cream. You are welcome to make suggestions, but only that. Also, many people don't let an entire pint melt and then eat the whole thing. For many people that would be the majority of their calories for the day. I shouldnt have to melt an entire pint to get at the mix-ins. That's just silly. I apologize...Everyone has freedom & equality of Ice Cream ... I guess I was trying to be helpful, but i now realize . . . I was being BIASED ! YOU ALL EAT YOUR ICE CREAM THE RIGHT WAY -- FOR YOU !!! Are you confused that using all caps is considered yelling on the internet? or are you confused that you are telling others what to do rather than offering a suggestion. A better way to make your point would be "I prefer to let the whole pint temper and then mix it all up so I get a better balance of mix-ins in every bite". Does that not make more sense?